If you’re a tribe member, it is highly likely that you’ve been getting consistent results in your wholesaling business. However, if you want to build a million dollar wholesaling business and enjoy true financial freedom, you need to take things to the next level. And that’s what our guests today are in the process of doing. Josh and Marlena Dates are a husband and wife team of former public school teachers who are now running a successful wholesaling business from home. In 2018 alone, they were able to close a total of 39 deals and earned a whopping $655,000 in gross revenue! With Todd’s help, they’re now ready to take their business to the next level. 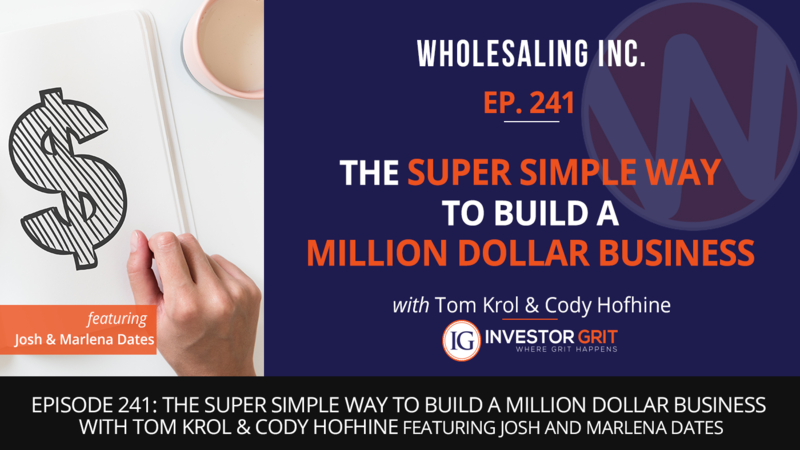 If you are like Josh and Marlena and would like to take your wholesaling business a step further, you can’t miss this episode! You’ll surely discover easy, practical, and actionable tips that can help you build that million dollar business you have always wanted!